Bjorn: played in three Ryder Cups and was vice-captain in four. THOMAS BJORN will captain Europe at the next Ryder Cup which takes place in Paris in 2018. The announcement was made on Tuesday morning after the European selection committee identified the Danish golfer as their preferred candidate to succeed Darren Clarke. The 45-year-old has Ryder Cup experience both as a player and as a vice-captain, and was one of Clarke’s assistants at Hazeltine in September. Europe lost 17-11, the continent’s first defeat in the match in eight years and their heaviest since 1981. Bjorn was selected by a five-man committee comprised of Europe’s three most recent captains — Clarke, Paul McGinley and Jose Maria Olazabal — players’ representative Henrik Stenson, and European Tour chief executive Keith Pelley. The 2018 Ryder Cup is scheduled to take place at Le Golf National from 28-30 September. Email “Thomas Bjorn named as Europe's Ryder Cup captain for 2018”. 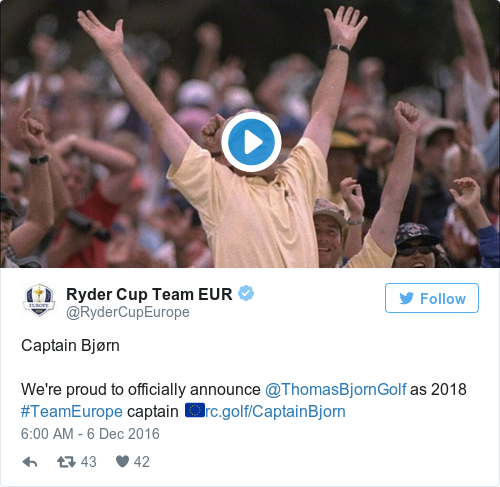 Feedback on “Thomas Bjorn named as Europe's Ryder Cup captain for 2018”.